Among the affordable places, this one is very lovely. The staff are super kind, their garden courtyard romantic and cozy. Breakfast is included and the place is very secure and quiet compared to others. It gets a little cold! Arriving at night, I found my room really dark, small and dingy. The dead end street was kind of creepy as well. The worst part of my one night stay was the noise. A drunk man yelling from yard of the people that lived next door and then as he quieted down the guys who were staying next door sat in the patio chatting which was like an echo chamber into my room.When they finally moved inside next door it was not much better. The next morning I moved to Casa Cristina which was a few dollars more, but sooo much nicer.. light. bright and pretty.. no comparison. A relief. I arrived bedraggled from my 6 hour bus ride from San Salvador to this quiet haven, the halls illuminated by tea lights, and the owner waiting up for me. Even though it was the rainy season, I took advantage of the covered porch to watch the lightning illuminate the volcano during the storm. Staff are friendly and helpful. Close to Parque Central. 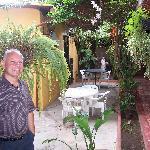 This is the second hostel we have stayed in in Antigua (the other being El Hostal). While both are good Hotel la Casa de Don Ismael is the better of the two. 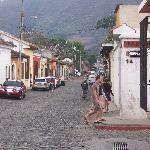 The service is excellent and we feel very well looked after by the Guatemalan family who run it. The rooms are spotless, the beds comfy and they have lovely furniture and at £15 a night with breakfast for 2 it is an absolute bargain. There is free wifi, a laundry service and a kitchen if you need. This is not the place to party the night away but if you are looking for a first rate local family run hostel we can't recommend Hotel la Casa de Don Ismael more highly. Don Ismael is great, so is his staff. A cute, basic, home style hotel on a quite (dead-end) street so it is not noisy from the street. Nice breakfast and coffee included in our rate. They picked up us at the airport for an extra fee, highly suggested if it's your first time going to GUA. Found the previous comments right here at this web site and upon arrival in Antigua Guatemala, spoke directly with Don Ismael. The Hotel is part of the whole experience. It is right next to everything and just a short walk out the door takes you back five or six hundred years in time. The rooms are clean, the beds comfortable and the sorroundings are quiet and maintained in such a way as to make you feel like you are staying over at your favorite uncles' house. Don Ismael himself will cater to your every need and a perpetual and sincere smile always goes with the man. Would you like to have some breakfast? It is provided for you. Would you like your clothes washed? He will arrange it for you as well ( I myself, just went upstairs to the terrace, and used a "pila", just like my grandmother used to do, and did it myself with the provided soap and available clotheslines ). Want to have a quiet relaxing time? Just stay in your room, go upstairs to the terrace and take in the amazing view of town as well as the Agua Volcano ( chairs and tables are always neatly arranged there ). Want to stay "in touch"? A computer with internet access is at your fingertips ( I however do not recommend this; you are after all, in colonial times here and on vacation ). STAY HERE AND YOU RUN THE RISK OF FALLING IN LOVE WITH THE HOTEL, THE TOWN AND THE PEOPLE. A warm hug is only a blink of an eye away. Many happy returns fellow traveler. I will see you here in November.